A tall bathroom storage unit provides plenty bathroom storage space than their shorter counterparts as they're double the size in most cases. This additional bathroom storage area doesn't require any more floor space which makes these taller units even better space-savers for those with smaller bathrooms! Whether you're looking for tall boy units, tall bathroom cupboards or a set of tall bathroom drawers we have lots of styles to complement your setting. Choosing a tall wall hung unit will give the room a bigger feel whilst adding tons of style option or tall freestanding bathroom units for a versatile storage option which can be positioned almost anywhere in your bathroom. 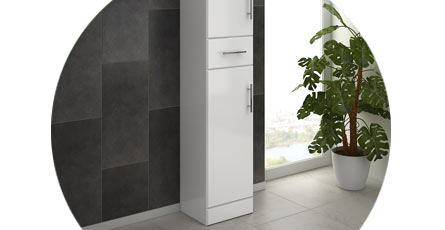 Tall bathroom storage units come in a wide variety of colours and finishes to match almost any setting. Browse lots of tall storage units with a wood finish, gloss finish and more for a desired look. Then choose the perfect colour for your bathroom and give your bathroom a fresh new feel with the perfect tall bathroom storage unit.